Relajante casa histórica en el hermoso lago Worth. Cerca de la playa y del centro. Cómoda casa de campo cerca de la calle principal, la playa y el muelle. Puede dormir 4. Visite esta encantadora casa histórica de Lake Worth. Venga y disfrute del estilo ecléctico de Lake Worth. Hermosas playas, muelle para pescar y ver el amanecer, golf, parques, tiendas, restaurantes, galerías de arte. ¡Camina o en bicicleta a todas las atracciones! La cabaña es una cómoda casa de 2 dormitorios con un jardín en ciernes y patio. La cabaña tiene 2 dormitorios (una reina / una individual), y puede acomodar a personas adicionales con camas inflables individuales. If you want a relatively inexpensive, clean, comfortable cottage with all of the necessities and very accommodating owners, I would highly recommend this cottage. However, if you are looking for accommodations in a gated community with community amenities or a home with private parking or a garage this is not the place for you. 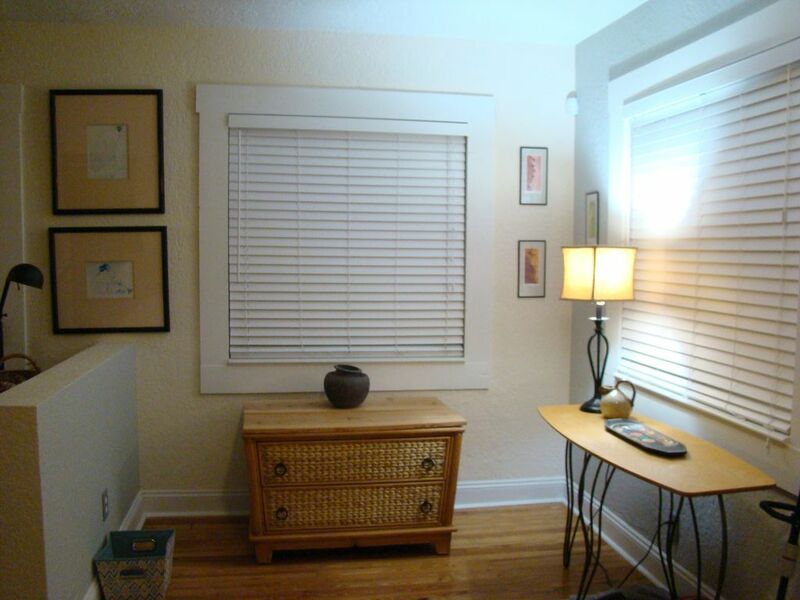 This cottage is clean, cozy and conveniently located for getting to local attractions. It was perfect for us retired couple and there was enough space in the second bedroom to accommodate our son who visited for a couple of nights. TV choices were limited but Chromcast and NetFlicks were easily available. We hope to return next year. Had a great experience over the Christmas break.Very clean and well stocked home.Safe location and walking distance to live music,bars and restaurants.Easy check in and great communication. This home had everything we needed for a pre cruise stay. The location is great. It was close to the friends and family that we wanted to visit. There are lots of stores nearby and it is not far to downtown Lake Worth. Everything in the home was very clean. We walked around inside with bare feet, and the bottoms of our feet stayed clean! We had a great experience and would stay there again! As noted by other reviewers, this property was well stocked and appointed with everything you might need to enjoy your stay. We certainly did! The beach, shopping and attractions were all only minutes away. The living room TV thoughtfully included built-in Chromecast for a convenient connection to your tablet or phone to display your personal content. (Chromecast for the other TVs would have been nice too!) The owners provided keys to the yard gate for convenient access to the yard and kitchen area when unloading grocery and other items. Despite the throw rugs beings a bit slippery on the floors - including the bathroom - and grab bars missing in the tub/shower area, WE LOVED IT! .... and wouldn't hesitate to book it again.